If your experiences are like mine, you have been warned about giving your child juice. These warnings suggest juice leads to obesity and tooth decay (which is true if you send your child to bed with a sippy cup of juice). I have always significantly watered juice down for my toddlers. 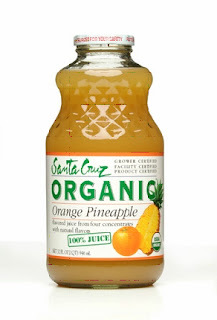 The Organic Consumer’s Association (OCA) has debunked the myth that juice causes obesity. “Contrary to popular belief, drinking pure 100 percent fruit juice does not make young children overweight or at risk for becoming overweight, new research shows. Pure fruit juice provides essential nutrients and, in moderation, may actually help children maintain a healthy weight.” The culprit is all of those juices that aren’t 100% juice, especially if they contain high fructose corn syrup. *Always read the ingredient label on the back of the product. If there’s anything other than fruit juice in the product, it must be listed there. *”Made with REAL Fruit Juice” could mean it really only has a small percentage of fruit juice. *All beverages that imply they contain juice must declare the percentage of juice on the information label near the top of the Nutrition Facts panel. *If a product is labeled as Fruit drink, juice beverage, juice cocktail or “ade” — the product is likely full of artificial sweeteners and contains very little juice. *Oftentimes a “100% juice” product contains juice fillers. Read the ingredient label, and you’ll frequently find your cranberry juice, for example, is mostly apple juice. *Keep in mind that conventional fruits and juices contain pesticide residues, and that industrial scale fruit production is an environmental disaster. Protect your health and the health of the planet by consuming organic fruits and fruit juices. « Giant Bugs on the Floor!